(Paris, New York, Kampala, Bujumbura) Today, FIDH and ITEKA are releasing a report, Repression and genocidal dynamics in Burundi, the result of months of investigation and analysis on the repression and crimes perpetrated by the regime’s forces in Burundi since the popular protests in April 2015. Recent actions taken by the Burundian authorities and evidence collected by FIDH and ITEKA confirm the extremely disturbing radicalization of the regime. The use of propaganda based on ethnic ideology, secret perpetration of mass crimes, reliance on elite units and militias to suppress opponents, suspension of cooperation with the United Nations and withdrawal of Burundi from the International Criminal Court (ICC) indicate a dramatic deterioration of human rights on the ground. The President of the Burundian Senate, Révérien Ndikuriyo, speaking on November 1st 2015 before his partisans and youth militias of the ruling party (the Imbonerakure), pointing to the Tutsis stated: “If you hear the signal with a reference that this must end, there can be no room for emotions and tears! You must pulverize, you must exterminate these people (...) Wait for the day when we say "work", you will see the difference!" The report documents and denounces violence against human rights defenders, journalists and intellectuals, those who courageously continue to investigate and bring light to the situation. It further denounces the crimes of the armed opposition groups who carry out targeted assassinations and attacks fostering violence and reinforcing repression. To halt further deterioration of the situation, FIDH and ITEKA call on the African Union and the United Nations to deploy a peacekeeping mission to protect the civilian population. The severity of the crimes committed and the total impunity enjoyed by their perpetrators should galvanize the ICC to investigate the crimes committed in Burundi. Furthermore, the inclusive inter-Burundian dialogue must be restarted to find a solution to the crisis. The #StopThisMovie campaign, articulated around the trailer of the film Genocide in Burundi, the only film you don’t want to see and a petition addressed to the United Nations. 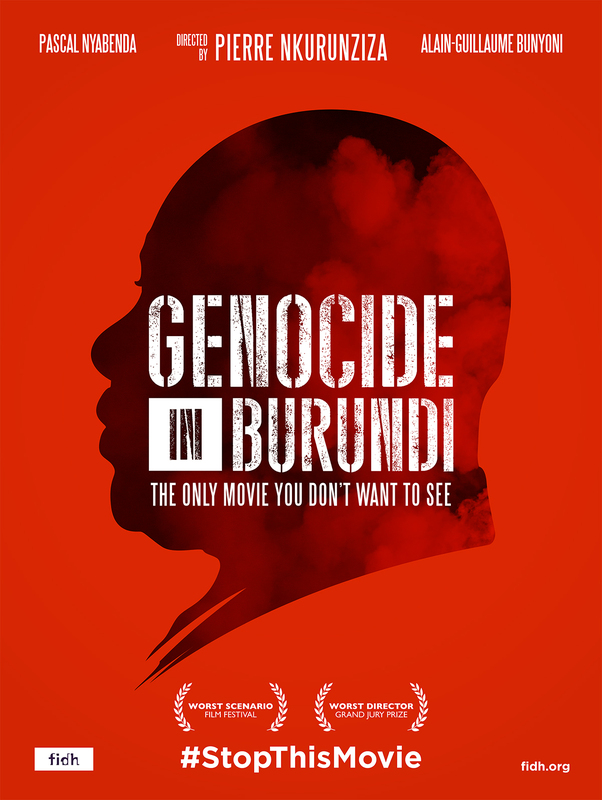 The campaign shows a fictitious film which no one wants to see happening: Genocide in Burundi, whose director is none other than the Burundian President Pierre Nkurunziza and the actors, the agents of the regime’s repression. The purpose of this campaign is to mobilize a large audience about the situation in Burundi and encourage them to act by signing a digital petition to demand that the international community takes the measures necessary to end these crimes. On 26 April 2015, thousands of people descended into the streets of Bujumbura, the capital of Burundi. They protested peacefully against President Nkurunziza’s decision to seek a third mandate. The repression of the police forces was immediate and brutal. During the first protest, five civilians were killed by the police, including a 17‑year old student, Jean Nepomuscène Komezamahoro, shot at point-blank range by a police officer as he was surrendering on his knees with his arms up in the air. More than a year and a half after the crisis started, the toll is alarming: more than 1,000 people killed, 8,000 detained, 300 to 800 disappeared and hundreds of people tortured. Women have not been spared: several hundred of them have been victim of sexual violence. More than 310,000 people have already fled the country. Primarily to Tanzania, Rwanda, the Democratic Republic of the Congo and Uganda.